There is only ground for divorce in the UK, which is that your marriage has irretrievably broken down. You will need to have proof that your spouse/civil partner has committed adultery or ensure that they will agree to a divorce based on this reason. The place of adultery and the date when it was committed, or when you became of the same, will need to be included when detailing this fact on the divorce petition. If you have been subject to unreasonable behaviour which includes acts of violence, emotional abuse or lack of support, this can be presented as a strong reason for divorce. A petition based on this reason does not need to be very detailed. However you must be able to recall and share details of a minimum of four incidents, which you deem to be acts of unreasonable behaviour. NB In relation to the above two reasons, if you have resumed the relationship for a period of six months or more from the date of the adultery or last incident cited then neither of these reasons can be relied upon in support of divorce. You will need to state that your spouse/civil partner left you without your consent for a period of two years and you have no knowledge of their whereabouts. If You have consented to living apart socially, sexually and domestically for a period of two years immediately before presentation of the divorce petition you can file for divorce of grounds of consensual separation. There are many forms of separation e.g. you can still be living in the same house and be separated. 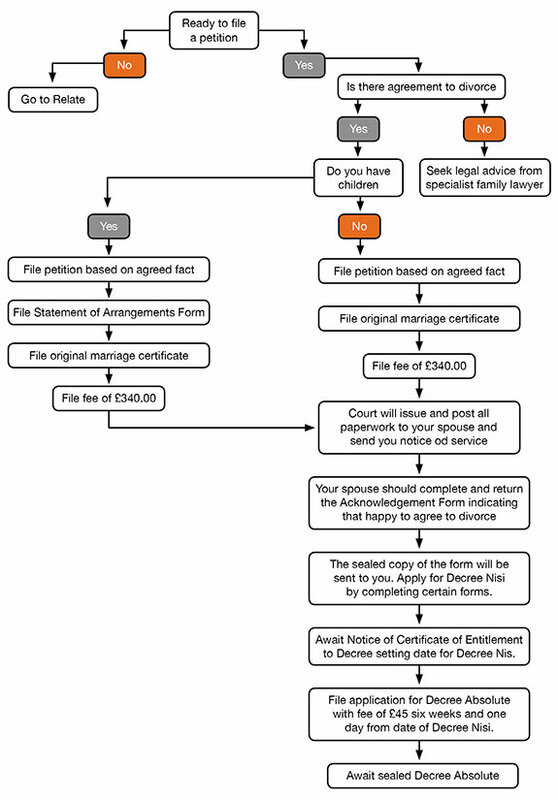 In all cases you must be able to confirm the date of separation and ensure both parties consent. If you have been living apart socially sexually and domestically for a period of five years immediately before presentation of the divorce petition you can file for divorce. The other party’s consent is not essential in this case.